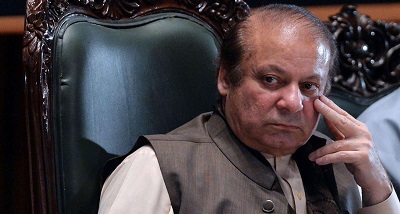 Pakistan's jailed former prime minister Nawaz Sharif was shifted back to Adiala Jail from a hospital today following improvement in his health. Sharif, 68, was admitted to the Cardiac Centre of the Pakistan Institute of Medical Sciences (PIMS) in Islamabad after his health deteriorated due to heart trouble in the jail on Sunday night. Sources in the PIMS said that various tests were performed on him, which showed a lot of improvement in his health, and doctors decided to shift him back to the jail. Heavy security measures were taken to shift him back to jail. The three-time Pakistan premier is serving a 10-year jail term in a corruption case over his family's purchase of luxury apartments in London.